A coworker of mine was planning her wedding. She was telling us about it when she went a little off topic and started discussing her relationship with her mother. All I could think was, “WHOA, this sounds like an abusive relationship.” And I tried as kindly as possible to point that out as the conversation headed increasingly south. But I realized as I told her this that there was a stark difference between our point of views. We both agreed that it was an abusive relationship. But she loves her mom. And because I don’t understand that bond, I realize quickly that I am somehow more objective but still missing the point of why this abusive relationship continues. In my last post on parent-child relationships, I talked about a review for Julia Blackburn’s book, The Three of Us. An author quote that I briefly mentioned in the blog, really struck a chord with me: “I have to be fond of my mother, simply because I have nothing else in this … world to cling to,” Blackburn wrote at 16. I also realized that I had no other adult to cling to as a child. So I kept my mother’s abuse a secret, afraid of her and afraid to be without her. My aunt was a great role model as were my teachers but the secret detached me from them. I was isolated because of it. Because I felt that if people didn’t know this great secret about my life then they really couldn’t know me. But unlike Blackburn, I couldn’t cling to my mother. I would have been risking my soul, my heart, my mind. I tried to cling to my mother. But she rejected me. Over and over again. But she gave me what to cling to in spite of herself. In my three younger sisters, I found all the love that I wasn’t getting. I found a reason to keep going, to keep living, to survive. But I hated the commandment that asked me to honor my parents. How could two such dishonorable people deserve honor? How could G-d ask this of me? While I was in the process of converting, a friend, who knew that I was still struggling with the 5th commandment to honor my parents, emailed me the following piece by a frum therapist Benzion Sorotzkin, “Honoring Parents Who Are Abusive.” Several points made in the piece shocked me. Passively submitting to chronic abuse wasn’t part of “honoring” my parents. I didn’t even have to forgive my abusive parent because that might do more harm to me. “Where possible, it is best for the child to move away. 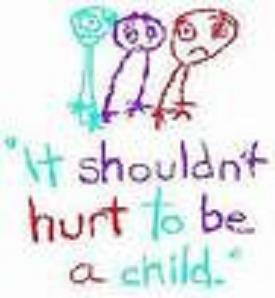 If interacting with an abusive parent makes a person emotionally ill then the child is exempt from this obligation.” What? Wow. And yet I still honor both my abusive mother and negligent father when I do good deeds and act as a good person. But I honor myself by refusing to remain silent about the injustices that too many children have had to experience. Previous Post Raised by Wolves?